NORTH LAKE TAHOE, CA--(Marketwired - Nov 5, 2013) - Getting into the seasonal spirit happens any number of ways. From crafting ornaments to experimenting with hot chocolate recipes, the options seem as endless as the forest of pine trees stretching up the Sierras. And while individuals may select a handful of ways to mark the season, The Ritz-Carlton, Lake Tahoe takes a more comprehensive approach. Its upcoming calendar of events suggests that, at this Lake Tahoe family resort, there are never too many ways to celebrate together. December 7, 4:30 p.m. to 6:00 p.m. Resort guests and community members can enjoy a festive start to the season at this fourth-annual treelighting celebration. Attendees arrive at the Living Room to partake in s'mores with the Marshmologist, sip hot chocolate, decorate cookies, craft ornaments and enjoy holiday performances by the children of the Boys & Girls Club of North Lake Tahoe and the Tahoe Expedition Academy. The event is complimentary and a great way to introduce guests to the resort. Saturday, December 7, 14 and 21; 3:00 p.m. to 4:00 p.m.
Daily from December 20 through 31; 4:00 p.m. to 6:00 p.m. Guests can sample the world's favorite food in two of its finest forms at Café Blue. They can enhance the North Lake Tahoe resort's signature hot chocolate with whipped cream, house-made marshmallows, peppermint bark and more. Or they can pair rich, creamy melted chocolate with an assortment of specialty fruits and pastries. Tuesday, December 24 and Wednesday, December 25; 4:00 p.m. to 10:00 p.m.
Wednesday, December 25; 3:00 p.m. to 7:00 p.m.
Thursday, December 26, Friday, December 27 and Saturday, December 28; 7:00 p.m.
Family movies provide one tempting reason for guests to leave their luxurious suites. Families can settle in at The Pines Ballroom during these complimentary events and get swept away by the magic of the silver screen. Daily from December 26 through December 30; 3:30 p.m. to 5:00 p.m.
From designing picture frames to decorating cookies, each day welcomes a new activity to inspire family-friendly creativity at the Kids Crafts & Creations Workshop. These complimentary projects enhance the resort's Ritz Kids program, which provides year-round enrichment specially designed for the pint-sized guest. Tuesday, December 31; 8:30 p.m. to 1 a.m.
Tuesday, December 31; 5:00 p.m. to 8:30 p.m.
All prices are exclusive of tax and gratuity. To confirm hotel reservations at The Ritz-Carlton, Lake Tahoe, please contact your travel professional, visit www.ritzcarlton.com/LakeTahoe or call reservations toll-free at 800-241-3333. To make a reservation at Manzanita please contact 530-562-3050. The Ritz-Carlton, Lake Tahoe is the first Forbes Four-Star and AAA Five Diamond resort in the Lake Tahoe area and the newest resort to be built in the region in decades. 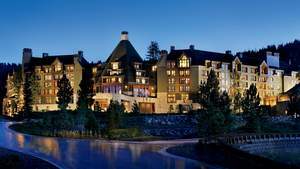 The 170-room resort, nestled mid-mountain at Northstar California is a contemporary mountain retreat featuring slope-side ski-in, ski-out access in winter and mountain concierge services for golfing, mountain biking and hiking in the summer. Manzanita, The Ritz-Carlton, Lake Tahoe's signature restaurant, features seasonally-inspired California cuisine with a regional mountain resort influence. The Highlands Spa is a 17,000-square-foot spa and fitness center with treatments and therapies themed around water and the woods. Guests will also enjoy preferred tee times and access to Old Greenwood and Gray's Crossing Golf Courses in the nearby historic town of Truckee. An inter-mountain gondola connects guests between the nearby Village at Northstar and The Ritz-Carlton, Lake Tahoe resort, situated a short 10-minute drive from the North Shore of Lake Tahoe. The year-round destination resort includes 170 guest rooms and 23 private Ritz-Carlton Residences. While individuals may select a handful of ways to mark the season, The Ritz-Carlton, Lake Tahoe takes a more comprehensive approach. Its upcoming calendar of events suggests that, at this Lake Tahoe family resort, there are never too many ways to celebrate together.